The Rocker SnapShell is the rigid removable shell in ToughBuilt's innovative SnapShell kneepad line. Hard-wearing, shatter-resistant plastic protects the knee on the roughest terrain while enabling easy side-to-side movement. Combined with the ergonomically-designed GelFit Knee Pads, ToughBuilt's SnapShells create the most versatile Knee Pads on the market. Easily interchange with other SnapShells to create the perfect kneepad for every job. Never again will it be a difficult choice what kneepad is right for you. As part of the Bosch Click & Go system, this Bosch L-DOLLY comes in handy when it's time to transport fully loaded L-BOXX's and other materials to and from the job site. Single-click stacking capability allows the L-BOXX cases to lock together--and to the dolly--for quick, secure portability. The durably built dolly features heavy-duty plastic construction for reliable performance. Rubber-wrapped wheels and ball-bearing casters allow for smooth transport across finished floors. The Bosch L-DOLLY accommodates the following cases: L-BOXX-1, L-BOXX-2, L-BOXX-3, L-BOXX-4, L-BOXX-3D, and L-BOXX-1A (cases sold separately). The Husky 46-inch (50-inch W with push handle) 9-Drawer Mobile Work Centre provides a variety of options for your tool storage needs. The solid wood top makes a beautiful and durable work surface area. The full-width drawer is designed to accommodate longer items that most tool boxes can't. Large aluminum drawer pulls are easy to grasp, even while wearing gloves. The 2-bottom drawers are extra deep for your heavier, bulk storage items and they are supported by a double set of 50 lb. ball bearing slides. The large 5-inch x 2-inch casters and steel tubular side handle allow ease in moving this versatile workbench. 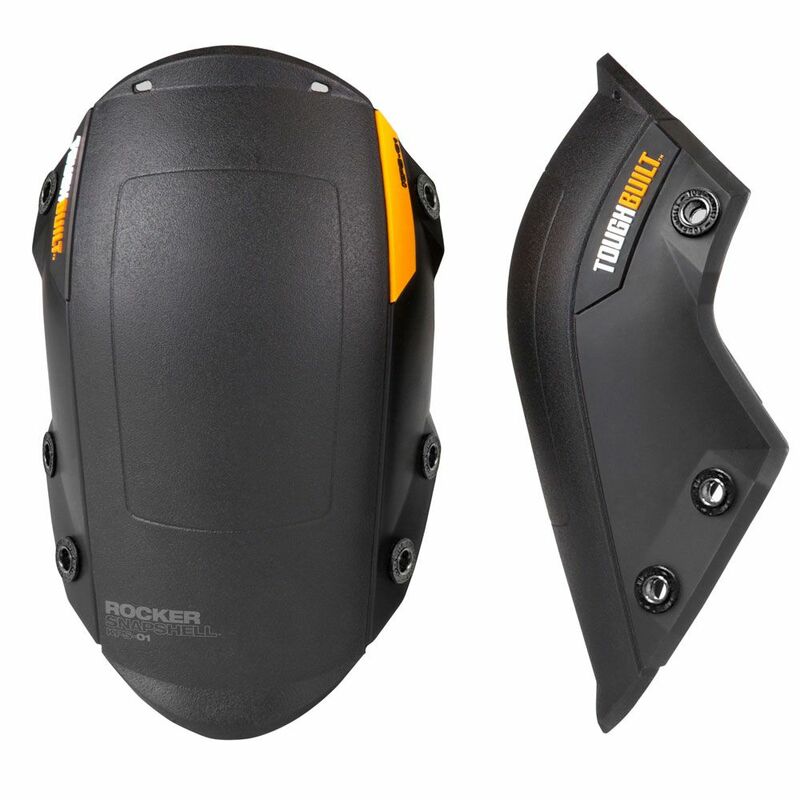 Rocker SnapShell The Rocker SnapShell is the rigid removable shell in ToughBuilt's innovative SnapShell kneepad line. Hard-wearing, shatter-resistant plastic protects the knee on the roughest terrain while enabling easy side-to-side movement. Combined with the ergonomically-designed GelFit Knee Pads, ToughBuilt's SnapShells create the most versatile Knee Pads on the market. Easily interchange with other SnapShells to create the perfect kneepad for every job. Never again will it be a difficult choice what kneepad is right for you. Rocker SnapShell is rated 3.4 out of 5 by 12. Rated 5 out of 5 by HomeDepotAddict from Tough hard protection. Keeps knee pads clean. Keeps knee pads clean. Great for all around use. Ev... Tough hard protection. Keeps knee pads clean. Keeps knee pads clean. Great for all around use. Even in gravel when working on tractors or implements. A bit hard to snap on and off but they stay secure despite hard use on rough surfaces like crush gravel. Rocker SnapShell protectors are exactly what was wanted to protect the best knee pads ever. Rated 3 out of 5 by broberts5384 from The snaps go on easy and stay on, the only... The snaps go on easy and stay on, the only problem I have is I thought the gel pads would fit my other shells, as my old gel pads are starting to fall off because the velcro ts loosing all the hook & loops. Rated 1 out of 5 by becca from It will fit and stay on but it takes a... It will fit and stay on but it takes a lot of effort. I'm not a fan of the interior piece though anyway.